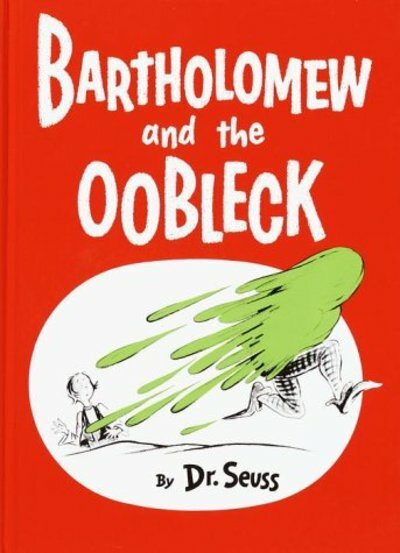 Spending time with my nieces and nephew recently brought back fond memories of -- among other things -- Dr. Seuss, specifically, a tale called Bartholomew and the Oobleck. It's not one of the best-known works (and it's in prose rather than Seuss' trademark rhyming), but I've always liked it. Anyway, Bartholomew is a royal page in the Kingdom of Didd. King Derwin is a bit of a dunderhead who decides he's bored with plain old water-based rain and show, and orders the casting of a magic spell that causes a green sticky substance to rain down from the sky. The stuff was called "oobleck," and as often happens with magic spells, it turned out to be more troublesome than entertaining, gumming up the entire kingdom until the creatively pragmatic Bartholomew figures out how to save the day. Very few people would associate Dr. Seuss with science, but if you're, say, me, the tale provides the perfect segue into a discussion of Newtonian versus non-Newtonian fluids -- and who wouldn't want to talk about that first thing on a Monday morning? Of course, I mean "Newtonian" as in Sir Isaac Newton, that 17th century stood-on-the-shoulders-of-giants physicist. Towards the end of his life, Newton delineated the properties of what he deemed an "ideal liquid," of which water is the best example. One of those properties is viscosity, loosely defined as how much friction/resistance there is to flow in a given substance. The friction arises because a flowing liquid is essentially a series of layers sliding past one another. The faster one layer slides over another, the more resistance there is, and the slower one layer slides over another, the less resistance there is. Anyone who's ever stuck their arm out of the window of a moving car can attest that there is more air resistance the faster the car is moving (air is technically a fluid). That's the basic principle. But the world is not an ideal place, and not all liquids behave like Newton's ideal liquid. In Newton's ideal fluid, the viscosity is largely dependent on temperature and pressure: water will continue to flow -- i.e., act like water -- regardless of other forces acting upon it, such as being stirred or mixed. In a non-Newtonian fluid, the viscosity changes in response to an applied strain or shearing force, thereby straddling the boundary between liquid and solid behavior. Physicists like to call this a "shearing force": stirring a cup of water produces a shearing force, and the water shears to move out of the way. The viscosity remains unchanged. But non-Newtonian fluids like oobleck? Their viscosity changes when a shearing force is applied. Ketchup, for instance, is a non-Newtonian fluid, which is one reason smacking the bottom of the bottle doesn't make the ketchup come out any faster; in fact, it slows it down, because the application of force increases the viscosity. Blood, yogurt, gravy, mud, pudding, and thickened pie fillings are other examples. And so is oobleck. They aren't all exactly alike in terms of their behavior, but none of them adhere to Newton's definition of an ideal liquid. Perhaps you got to play around with a manmade version of oobleck in middle school science class. I didn't, but some of my pals vividly remember doing so, which doesn't speak well for my early science education, although I do recall making something called glurch in chemistry class -- starch, glue and food coloring -- as an experiment in polymerization. Oobleck is even simpler to make. You combine 2 cups of corn starch with 3 drops of green food coloring and gradually mix in enough water to create a mixture that resembles pancake batter (usually about equal parts starch and water). Ta-da! Your very own oobleck! And just as the Didd-ians discovered, it's a sticky, messy substance. It's also fascinating in its behavior, as this video by a group of Gonzaga University students (who claim they were just bored during spring break and decided to film their kitchen experiment for posterity) aptly demonstrates. The substance becomes thicker, or more viscous, in response to agitation, compression or other similar applied forces: punch the oobleck, and it hardens into a solid, softening into a fluid again once the energy dissipates. Compress it into a ball and toss it in the air, and it will quickly lose its shape and flatten before it lands. (Side note: non-drop paint exhibits the opposite effect, brushing on easily but become more viscous once it's on the wall. And under rare circumstances, liquid hydrogen and liquid helium can become superfluids, exhibiting zero viscosity at extremely low temperatures.) As the Gonzaga students correctly (albeit blasphemously) note, you can be like Jesus and literally walk across a cornstarch/water mixture, as these Barcelona folks did, filling a pool with the mixture using a concrete mixer truck. Things get even weirder if you put the mixture into an agitator. No wonder oobleck is such a time-honored favorite on YouTube: you can find even more fun experimental videos here. Similar shear-thickening fluids are already being used on prototype bullet-proof vests and sporting equipment, because their sensitivity to impact means they can better absorb the energy of a high-velocity projectile or hard impact, while still being flexible enough for wear comfortably. For instance, at the University of Delaware, scientists treated the fabric of Kevlar vests with a shear-thickening fluid (silica particles suspended in polyethylene glycol). Under normal conditions, the molecules of the treated material are weakly bonded and can move around with ease; that's why the material is so flexible. But the shock of any impact -- a hard fall, or incoming bullet -- will cause those chemical bonds to strengthen so the molecules lock into place and the fabric becomes instantly rigid. Once the force from the impact dissipates, the bonds weaken again and the vest becomes flexible again. The US and Canadian skiers in the 2006 Winter Olympics wore a similar form of "smart armor" manufactured by a British company called d3o Labs. Once you're mired in the stuff, it's very difficult to get out: Wikipedia informs me that the trapped person "must apply sufficient pressure on the compacted sand to re-introduce enough water to liquefy it. The forces required to do this are quite large: to remove a foot from quicksand at a speed of one centimeter per second would require the same amount of force as that needed to lift a medium-sized car." God forbid your entire lower body should be submerged: the necessary force to return the stuff to a more fluid form would be beyond anything you could muster. Maybe a pal could happen by -- hopefully before the tide comes in and drowns you, should you be unfortunate enough to become trapped in Morecambe Bay in England -- and add some water to loosen things up sufficiently for you to break free. In which case, remember to move slowly out of it. Remember the Lightning Sand in The Princess Bride? That was a form of dry quicksand, which has been been deemed the stuff of legend by scientists for decades, despite reports of people and entire vehicles being swallowed instantly by desert sands-- just like the crashed biplane in The Mummy, which sank into dry quicksand in a matter of minutes, taking the newly deceased Captain Winston Havlock with it. Dry quicksand is basically loose sand whose bulk density has been reduced by blowing air through it, so that it yields more easily to weight or pressure. It might behave like wet quicksand, but there's no water in it; it's purely a granular material. In parts of the Sahara Desert, it's known as fech fech: a very fine powdery sand under a thin crust that acts as a surprise "trap". The ground can collapse quite suddenly beneath a jeep traveling through those areas, making them virtually impassable. It turns out that those legends of dry quicksand just might be true after all, thanks to work in 2004 by physicist Detlef Lohse and colleagues at the University of Twente in the Netherlands, who managed to create bona fide dry quicksand and reported their findings in Nature. The researchers filled a container with very fine-grained sand. There were holes in the bottom of the container, and the scientists blew air through it, then shut down the stream of air so that the grains rearranged themselves downward to form a loosely packed substance. Then they hung a pingpong ball filled with tiny bronze balls (just so they could vary the weight in repeats of the experiment) from a thin piece of rope, so that the ball was just touching the sandy surface. The rope was burned through, at which point the ball fell into the sand in one sharp movement. And it moved effortlessly through the sand, rather than the sand being able to support its weight via chains of invisible force -- which is how sand normally behaves. Should you be at the Space Needle when a youngster orders the Lunar Orbiter in the future, this is your chance to explain the science behind dry ice: namely, the mysterious nature of phase transitions. In this case, dry ice is created in such a way -- by pressurizing carbon dioxide gas and rapidly lowering the temperature -- that the gas freezes directly into a solid, skipping the liquid phase altogether. (Like many serendipitous breakthroughs, it was first observed in 1825 by a French chemist named Charles Thilorier, who was actually investigating something else entirely.) Adding hot water to the very dry ice reverses the process, producing a heavy fog instead of melting into a liquid. There's tons of online resources for conducting your own experiments with dry ice for those who want to do their own investigating. Just remember to wear gloves when handling the super-cold substance, and if you're creating fog, to do so in a well-ventilated area. The fog is water vapor mixed in with CO2, and the latter is heavy enough to concentrate at toxic levels close to the ground. An entire subplot of C.S.I. rested on this fact: a physics student wants to take revenge on a jock who seduced, then abandoned her, so melts blocks of dry ice, releasing the water vapor and CO2 into his dorm room in hopes that it will make him sick. But she miscalculates: he and the femme-de-la-nuit end up sleeping on the floor, and are killed instead by the toxic vapors. Jen-Luc Piquant urges everyone to use their scientific knowledge for good, but if you're to hell-bent on engaging in a bit of mischief, it's wise to always double check your calculations. BTW, Seuss fans will be flocking to theaters next Spring for Horton Hears A Who! I hadn't heard about that CSI episode. Interesting. Hm, didn't the Mythbusters tackle walking on a cornstarch solution already? Despite the Wikipedia article, the myth about the force needed to remove oneself from quicksand is exactly that: a myth. This has been demonstrated recently on television, both on the show Mythbusters, and by "Bear" Grylls on the Man vs. Wild television show. In both cases, people had no trouble whatever extricating themselves, in clear view on television, from quicksand. While they claimed it was a bit tiring, it was easy to do. While some situations on Man vs. Wild have been shown to be contrived, it would have been difficult to fake these particular circumstances. Wow. They must have needed a lot of corn starch to fill a volume that large. We once decided to fill a kiddie pool up with oobleck, and it required all of the corn starch from all of the Star Markets in Cambridge. I think the cashiers were mildly weirded out. WRT dry quicksand, hasn't there been fluidized-bed (dry powder with various gases blown up through it) industrial-scale chemistry for decades now? Wouldn't this have provided an instance proof for dry quicksand? for a senior prank we were thinking of filling the quad with oobleck. our quad has a two step down area that would be perfect for a huge pool if we were able to get in enough oobleck...natural we won't have acces to a mixing truck or anything...and it's a rather large area. any suggestions would be great! where did you get all the cornstarch?